Posted by Yilan in Brussels, Human rights abuses, Turkey, Yunanistan. Barrier is latest attempt to stem flow of illegal migrants attempting to enter the EU through Greece. 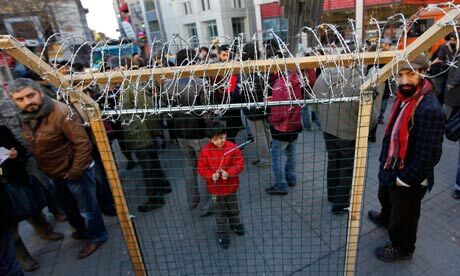 Supporters of the Migrant Solidarity Network gather near barbwire fencing, which they set up to represent the fence Greece plans to erect on its Turkish border, during a protest in Istanbul. Photograph: Murad Sezer/ReutersThe Greek government’s plans to build a wall three metres high along part of its border with Turkey have prompted confusion in Brussels. The project, unveiled by the minister of civil defence, Christos Papoutsis, aims to restrict illegal immigration in an area with no natural barriers. The strip of land has become a major thoroughfare for migrants attempting to enter the European Union, with 90% of illegal migrants now passing through Greece.